Kitty cats, to the left feast your eyes on le luscious Leroy in Chestnut Leather from Sam Edelman; to the right take a peek at Black Rooster’s haute Highpeak in Cognac. Though the Black Rooster beauties sport a slightly lower platform (1/2”) and slightly higher wedge (4”) than that of the lovely Leroy; for just $79.20, in comparison to the $149.00 required to take the enchanting Edelman’s home, they are the perfect way to snag a bit of Sam style – at a price that leaves over enough spare change to indulge in more than one charming color (Cognac, Blush, Gold, and Black)! So hard to choose. Both so much a like. Very nice find. I love the originals but would settle for the copy if they were cheaper! Such a great find. I'm afraid I'd have to try both on..before I could definitely decide. Aah those are so cute! I'd definitely get a cheaper pair. A big saving on these, because I'd have to take a pass on both. I need a lower wedge! Those black roosters are awesome! Louie chewed my wedges, these are so cute! 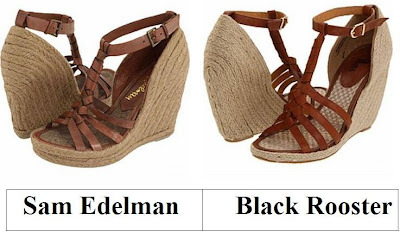 I'd get the Sam Edelmans because the toe part is a bit higher and I like that a little bit more. That just sounded as nitpicky as I thought it would. Hmmm, this is a tough one. I really can't decide until I try them on. They're both similar, so comfort would be the deciding factor for me! I think I'd probably take the cheaper ones. Those are so similar, I'd definitely pick the Black Rooster ones! Those are cute! They're such a beauty. The Same Edelman ones are absolutely gorgeous. I can imagine strolling around in the summer in these. i feel forced to splurge this week, the sam edelman wedges are stunning!! I actually love these although they're not my usual style. Love love love the Sam Edelman, the wedge is a little higher and all of the Sam Edelman fit PERFECT on me.... I would pull out the X-tra cash for those. Either would do -they look so alike . Had to pass up on a pair of wedges this week as it's winter here and I need boots more than wedges! Such great wedges. Great Black Roosters too. This just summer to me. Wow. OMG erica, finally i can through blogspot. maybe there was error on my connection. about this post, the sam edelman is so awesome! it looks perfect.. I love the color of the Sam Edelmans! The rope heels are incredibly identical--although I do love the cognac color better. I wonder with a bit of shoe polish if the Sam version couldn't mimic the other pair even more? I will let you know if I dare! Hoping you are enjoying the long weekend Erika! Another great comparison post...this time I'd go for the Edelman's...the colour wins me over! Altho I wouldn't say no to either!! SUPER cute finds as always! hmph..I'm not sure which pair I like better. Maybe the black rooster? Unfortunately I don't like either, but if I did I would def go for the save. not sure if i would really wear either, but you can't really beat that Black Rooster price. I love the braided Edelman ones, they look great.